Triple Mother's Rings are the perfect accessory for a mother of one child. Put the child's on one band and then put the birthdate, your name, your spouse's name or a word such as "family" or "love" on the other bands. Customize it any way you want. 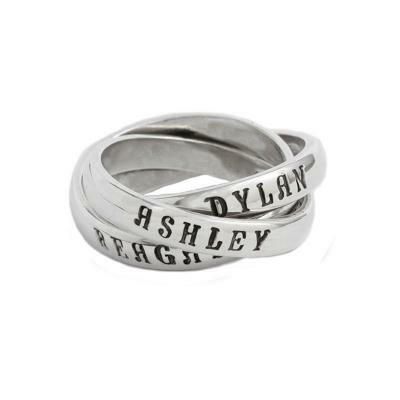 ideas for stamping: first name, middle name, birthdate or make it a family ring with you, your spouse and child's names. This name ring with three interconnecting bands creates a one-of-a-kind stamped piece of jewelry. Many women like the look of the triple band but they only have one child ~ but if you use your imagination you can come up with lots or words to create your custom ring. You can dedicate the ring to your child by putting their name, birthdate, middle name, nickname, "my angel", "my baby". Or you can make the ring a family ring and put the names for you, your spouse, and child. We design all of our products and do not use prefabricated blanks. This means our jewelry typically is heavier in weight making it sturdy enough to wear for a lifetime. I absolutely love my "Triple Stack" ring! Very good quality. I have received many compliments on it.